Mood (9.6%) and anxiety (12.9%) disorders are prevalent globally as shown in pooled data from 39 countries.1 Additionally, the Global Burden of Disease Study highlighted the increasing challenge that these disorders pose for health systems, regardless of economic standing, with depressive disorders accounting for 40.5% and anxiety disorders for 14.6% of disability-adjusted life years worldwide.2 Adding to this burden is the increased frequency of relapses and subsequent hospitalizations, which are disruptive for both individuals and their families and can lead to difficulties with work, housing, and the pursuit of meaningful life goals.3 Conventional treatment methods, such as psychotherapy, are both expensive and time consuming,4 especially in low- and middle-income countries such as South Africa.2,5 That said, cost-effectiveness is one component of health care costs, and the cost-effectiveness and complexity of treatment for mood and anxiety disorders are also dependent on the treatment setting and the health care system. There is a relative paucity of research on interepisodal mood monitoring in low- and middle-income countries. This potentially beneficial adjunct to routine monitoring may have utility in low-resource settings. If interepisodal mood monitoring is found to be feasible and to capture mood states over time, it could be integrated into the management of patients with bipolar disorder, thereby providing a convenient and readily accessible method for the monitoring of patient symptomatology and visual representations for the patient to aid in their self-management. This can contribute to early detection of relapse and provide timely treatment to those in need. As such, we aimed to assess the feasibility of telephonic interepisodal mood monitoring in patients with mood and/or anxiety disorders. Additionally, we aimed to gather data of longitudinal mood trajectories, in order to determine whether telephonic interepisodal mood monitoring influences these mood trajectories. Purposive sampling was used. Residents and consultants at a governmental psychiatric hospital provided the first author with the names of inpatients who met the following inclusion criteria: 1) 18 years or older, 2) able to provide informed consent, 3) access to reliable telephonic communication, and 4) diagnosis of either a mood and/or anxiety disorder. Participants were recruited prior to discharge and provided informed consent. Additionally, participants were informed at the baseline assessment that they would be phoned every Tuesday (and Wednesday and Thursday if they could not be reached), starting in the week after discharge. Participants were also asked if there was a specific time of day they would prefer to be phoned. All reasonable efforts were made to accommodate participants regarding the best time of day to phone them. At baseline, the measures detailed in the following sections were administered. A basic demographic questionnaire was used to determine participants’ age, ethnicity, gender, marital status, employment status, religious orientation, education, and basic income. Additionally, participants were asked if they knew of their current diagnosis, if they had previously been diagnosed with a psychiatric illness and received therapy, and if they had any medical concerns. The Life Events Checklist is a measure of exposure to potentially traumatic events that may give rise to a diagnosis of posttraumatic stress disorder.12 The Life Events Checklist demonstrated acceptable reliability with a Cronbach’s α of 0.688 for the current sample. The Childhood Trauma Questionnaire is a retrospective self-report instrument designed to examine the traumatic childhood experiences of adults and adolescents.13 The Childhood Trauma Questionnaire assesses five types of childhood trauma, including emotional abuse, physical abuse, sexual abuse, emotional neglect, and physical neglect.13 The Childhood Trauma Questionnaire demonstrated acceptable reliability with a Cronbach’s α of 0.858 for the current sample. Participants were phoned on a weekly basis, starting at approximately 1 week postdischarge, at roughly the same time each week (as agreed during the baseline assessment) for 26 weeks. Three attempts were made to contact each participant on a Tuesday, Wednesday, and Thursday of the week in question before data was noted as missing for that week. Thus, nine attempts were made to contact a participant each week, before data was noted as missing for that week. If participants had three consecutive weeks marked as missing, they were withdrawn from the study. Participants who completed all 26 weeks were provided with a Mood Chart tracking their mood states and either an airtime or grocery voucher (ZAR 300) of their choice. Participants’ weekly alcohol use and life event exposures were recorded. Additionally, the assessments mentioned in the following sections were conducted telephonically each week. At approximately Week 13, an independent researcher contacted participants to telephonically complete a semi-structured questionnaire regarding their experiences and perspectives of the study. The results of the semi-structured interview will be reported elsewhere. Participants’ clinical discharge summaries (hospital records) were accessed postdischarge. From the summaries, clinical data were extracted, including data on known substance use problems, previous psychiatric admissions, admission length, follow-up plan, mental state on discharge, discharge diagnosis, and prescribed medication. Data were electronically captured on Statistical Package for the Social Sciences (SPSS) version 24 (IBM Corporation, Armonk, NY, USA). Basic frequency and distribution analyses were conducted to provide descriptive data. Chi-square, Fisher’s exact tests, Student’s t-tests, and Mann–Whitney U tests were conducted to determine factors influencing study adherence. Analysis of variance (ANOVA) and least squares mean scores were calculated to determine factors influencing QIDS and ASRM scores, as well as mean scores over time. Significance level was set at p=0.05. The study was approved by the Health Research Ethics Committee of Stellenbosch University (S15/03/048). The first author individually met with patients who were referred to the study and provided them with a detailed description of the study. She emphasized that participation was voluntary and would not negatively influence treatment, and that all the information was confidential (except for the treating psychiatrist who would have access to the documents and be notified in the case of adverse events). Patients who agreed to take part in the study signed informed consent forms. Data was secured in a locked office, and electronic files were password protected. Quantitative findings of the study are reported here. Qualitative data (derived from semi-structured interviews administered at 13 weeks) are reported elsewhere. Seventy participants agreed to take part in the study. Nine participants (8 female) were excluded from the data analysis as they no longer met the inclusion criteria (i.e., diagnosis) postdischarge. The results that follow describe 61 participants. Demographic and diagnostic information is presented in Table 1. Notes: aSubstance use disorder with major depressive disorder as differential diagnosis; conversion disorder with major depressive disorder as differential diagnosis; schizoaffective disorder. Bold figure indicates significant value, p=0.05. Study attrition and retention were evaluated as indicators of feasibility of telephonic interepisodal mood monitoring. The study had a high dropout rate with 33 (54.1%) participants dropping out of the study. Of the 33 participants, 25 (75.6%) were identified as lost-to-follow-up after three consecutive weeks of missing data. Only seven participants actively voiced their desire to withdraw from the study. The majority of participants (59.4%) dropped out by Week 9, with most participants (seven) dropping out at Week 3. Women were significantly more likely to complete the study than men (Figure 1). No other factors significantly influenced study adherence. During semi-structured interviews conducted after 13 weeks of monitoring (full results published elsewhere), participants alluded to study length, and the monotonous nature of the research as reasons for dropping out. However, reasons for dropping out were not explicitly endorsed by participants. 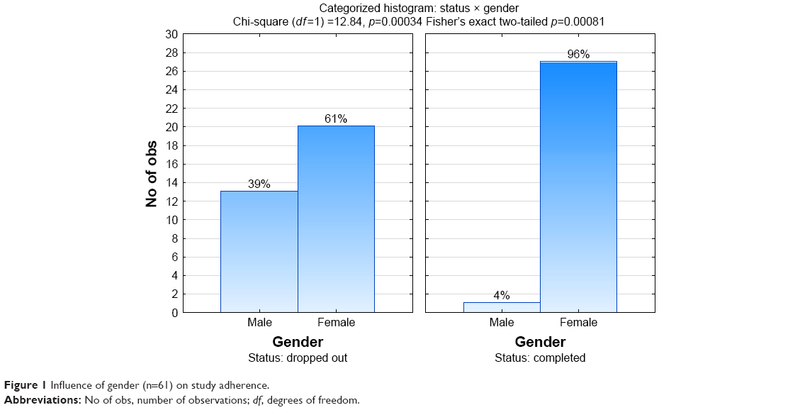 Figure 1 Influence of gender (n=61) on study adherence. Abbreviations: No of obs, number of observations; df, degrees of freedom. 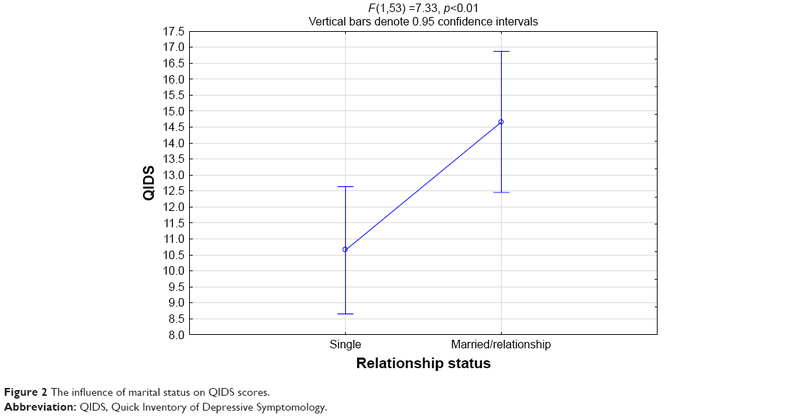 Relationship status was significantly associated with average QIDS scores, with single participants reporting lower depression scores (Figure 2) than participants who were married/in a relationship. Additionally, although not significant, single participants reported lower suicidality rates (as measured by QIDS item 12), than participants who were in a relationship or married (p=0.06). No other variables were significantly associated with QIDS and ASRM scores. However, there was a trend for women (mean =3.9) to endorse lower levels of mania than men (mean =2.7; p=0.07). Figure 2 The influence of marital status on QIDS scores. Abbreviation: QIDS, Quick Inventory of Depressive Symptomology. Participation status (completed vs dropped out) was not significantly associated with QIDS scores up until Week 11. Comparison after Week 11 was not feasible due to the high dropout rate. Consequently, the following results reflect the 28 participants who completed the 26 weeks. Depression scores decreased significantly (p<0.01) over 26 weeks (Figure 3) from 14.0 (standard deviation [SD] =5.8) at Week 1 to 11.0 (SD =5.9) at Week 26, p≤0.00. ANOVA confirmed the significant decrease over time with F(25, 626) =2.31, p<0.01. Depression scores ranged between mild and moderate throughout. Depression scores were highest at Week 1 (mean =14.0; SD =5.8) and lowest at Week 17 (mean =9.8; SD =6.1) postdischarge. Intraindividual QIDS scores are indicated in Figure 4. Figure 3 Depression (QIDS) and mania (ASRM) scores over 26 weeks. Abbreviations: ASRM, Altman Self-Rating Mania Scale; QIDS, Quick Inventory of Depressive Symptomatology. 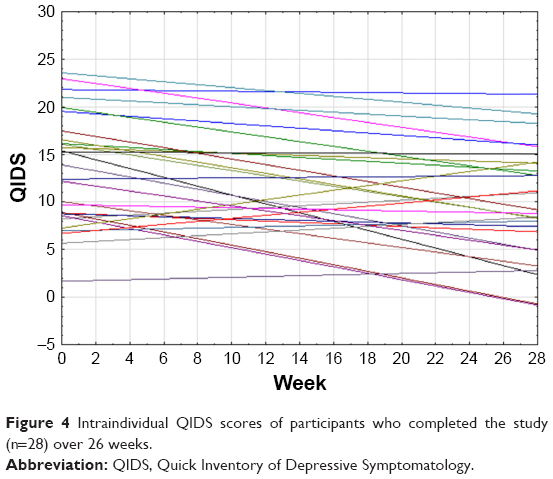 Figure 4 Intraindividual QIDS scores of participants who completed the study (n=28) over 26 weeks. Abbreviation: QIDS, Quick Inventory of Depressive Symptomatology. Participation status (completed vs dropped out) was not significantly associated with ASRM scores up until Week 11. Comparison after Week 11 was not feasible due to the high dropout rate. Consequently, the following results reflect those of the 28 participants who completed the 26 weeks. ASRM scores remained below the clinical threshold (i.e., score of <6) across the 26 weeks. Additionally, no variables were significantly associated with ASRM scores; there was no significant change in ASRM scores over time, although there were some significant differences between weeks. An ANOVA confirmed the lack of significant change over time, with F(25, 628) =0.99894, p=0.47. Mania scores were highest at Week 7 (mean =3.9; SD =4.6), and lowest at Week 19 (mean =1.6; SD =1.9). The current feasibility study of telephonic monitoring was conducted to longitudinally track mood fluctuations in patients diagnosed with mood and/or anxiety disorders using the QIDS and ASRM. Mood monitoring commenced approximately 1 week postdischarge. The rate of dropping out was high, in contrast to previous studies that reported high adherence rates.9,10,15–18 However, methodological differences across studies confound meaningful comparison. In other comparable studies, text messaging, e-mail, and/or web applications9,10,16,18 were used to monitor mood. Presumably, participants had more freedom and flexibility to complete the mood questionnaires at times convenient to them. This may have positively influenced study adherence. Indeed, one study19 found a significantly greater compliance in paper-and-pencil mood monitoring, where participants had the freedom to complete the mood charts at their own time, as compared to participants who had to complete the mood charts at a specific given time every day. Women were more likely to complete the study than men. In fact, only one male patient completed the study. Previous studies found no gender difference in adherence.20 No other factors significantly influenced study adherence. Relationship status was significantly associated with mean QIDS scores, with single participants reporting lower depression scores. This is in contrast to previous research which has found higher levels of depression among single people.21,22 However, comparison remains limited since Schachner et al21 and Simon22 did not utilize weekly mood monitoring, but rather once-off measures. Comparable weekly mood monitoring studies did not specifically consider the association between relationship status and weekly mood scores. No other factors were significantly associated with QIDS and ASRM scores. However, women reported slightly lower mean levels of mania than men. Whybrow et al18 reported that women were depressed and more manic more frequently than men. In contrast to our study, Bopp et al9 reported women diagnosed with bipolar disorder had significantly higher initial ASRM scores than men with bipolar disorder. In comparison, Bopp et al9 reported men with bipolar disorder to have higher initial mean QIDS scores than women with bipolar disorder; however, over time the difference evened out, and by the end, men and women had almost identical QIDS scores. Depression scores of the 28 participants who completed the study, which were in the range of mild and moderate depression throughout, decreased significantly over the 26 weeks. This is similar to previous mood monitoring studies which reported a decrease in depression scores over time, both a statistically significant9,23 and nonsignificant10 decrease. In contrast to previous studies,9,10,24 depression scores remained in the clinically significant range throughout. ASRM scores (for the 28 participants who completed the study) remained below the clinical threshold (i.e., score of <6) across the 26 weeks, irrespective of diagnosis. This is in contrast to previous mood monitoring studies where manic episodes have been reported.19 For example, Bopp et al9 and Miklowitz et al10 recorded both manic and mixed episodes in participants diagnosed with bipolar disorder over the monitoring period. Additionally, there were no factors that significantly influenced ASRM score, and there was no significant change in ASRM scores over time. Weekly telephonic mood monitoring of patients diagnosed with mood and/or anxiety disorders is deemed feasible although the high attrition rate is concerning, particularly among men, and this warrants further interrogation. Additionally, the lack of male participants who completed the study limits the generalizability of these findings to that gender. Mood monitoring was associated with a significant reduction in depression scores over time, although scores remained in the clinically significant range even after 26 weeks. ASRM scores remained below the clinical threshold. No manic, mixed, or euthymic mood states were recorded. The current data are limited by the sample size which precluded analysis of the association of other variables, such as influence of diagnoses, drug use, and sociodemographic variables on trajectories of mood 6 months post hospital discharge. The feasibility study highlighted a number of limitations that have since informed the implementation of the study proper which commenced November 15, 2016. First, the study duration was deemed to be too long, and the qualitative data collected (published elsewhere) revealed that participants were not happy about the 26 weeks of participation that was required. Consequently, the study length was adjusted to 16 weeks. Second, it was decided that patients with a comorbid diagnosis of substance use disorder and/or personality disorder would be excluded from the study proper as, in view of the complexity of intervention/s they required, they were not deemed suitable candidates for telephonic mood monitoring. Lastly, the Columbia Suicide Severity Rating Scale and Pittsburgh Sleep Quality Index were added at the baseline assessment and as monthly assessments in order to obtain more accurate data on participants’ suicide risk and sleep quality. We thank the participants who took part in the study. Additionally, we would like to thank Meija Bossert, Tracey Jacobs, and Sister Irene Mbanga for assisting with data collection. The current research was funded by the South African Research Chair Initiative in post traumatic stress disorder hosted by Stellenbosch University, funded by the Department of Science and Technology and administered by the National Research Foundation (Tier 1 level Research Chair), and Mr Chad Beyer, who conceived the study, has received research funds from the Stellenbosch University Undergraduate Research Grant. Steel Z, Marnane C, Iranpour C, et al. The global prevalence of common mental disorders: a systematic review and meta-analysis 1980–2013. Int J Epidemiol. 2014;43(2):476–493. Pratt SI, Naslund JA, Wolfe RS, Santos M, Bartels SJ. Automated telehealth for managing psychiatric instability in people with serious mental illness. J Ment Health. 2015;24(5):261–265. Newman MG, Szkodny LE, Llera SJ, Przeworski A. A review of technology-assisted self-help and minimal contact therapies for anxiety and depression: is human contact necessary for therapeutic efficacy? Clin Psychol Rev. 2011;31(1):89–103. Morriss R, Garland A, Nixon N, et al. Efficacy and cost-effectiveness of a specialist depression service versus usual specialist mental health care to manage persistent depression: a randomized controlled trial. Lancet Psychiatry. 2016;3:821–831. Strejilevich SA, Martino DJ, Murru A, et al. Mood instability and functional recovery in bipolar disorders. Acta Psychiatr Scand. 2013;128:194–202. Proudfoot J, Whitton AE, Parker G, Manicavasagar V, Nicholas J, Smith M. Evidence of weekly cyclicity in mood and functional impairment in those with a bipolar disorder. Psychiatry Res. 2014;218:290–294. Glasziou P, Irwig L, Mant D. Monitoring in chronic disease: a rational approach. BMJ. 2005;330(7492):644–648. Bopp JM, Miklowitz DJ, Goodwin GM, Stevens W, Rendell JM, Geddes JR. The longitudinal course of bipolar disorder as revealed through weekly text messaging: a feasibility study. Bipolar Disord. 2010;12(3):327–334. Miklowitz DJ, Price J, Holmes EA, et al. Facilitated Integrated Mood Management for adults with bipolar disorder. Bipolar Disord. 2012;14(2):185–197. Tuso P. Treatment progress indicator: application of a new assessment tool to objectively monitor the therapeutic progress of patients with depression, anxiety, or behavioral health impairment. Perm J. 2014;18(3):55–59. Gray MJ, Litz BT, Hsu JL, Lombardo TW. Psychometric properties of the life events checklist. Assessment. 2004;11(4):330–341. Wright KD, Asmundson GJ, McCreary DR, Scher C, Hami S, Stein MB. 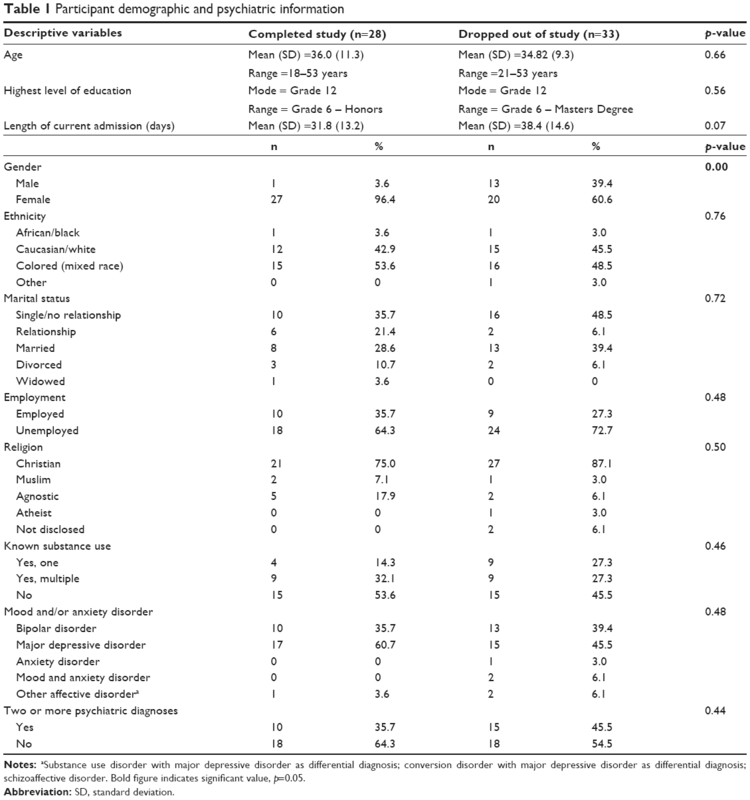 Factorial validity of the Childhood Trauma Questionnaire in men and women. Depress Anxiety. 2001;13(4):179–183. Bonsall MB, Geddes JR, Goodwin GM, Holmes EA. Bipolar disorder dynamics: affective instabilities, relaxation oscillations and noise. J R Soc Interface. 2015;12(112). pii:20150670. Faurholt-Jepsen M, Frost M, Vinberg M, Christensen EM, Bardram JE, Kessing LV. Smartphone data as objective measures of bipolar disorder symptoms. Psychiatry Res. 2014;217:124–127. Lieberman DZ, Kelly TF, Douglas L, Goodwin FK. A randomized comparison of online and paper mood charts for people with bipolar disorder. J Affect Disord. 2010;124(1–2):85–89. Todd NJ, Jones SH, Hart A, Lobban FA. A web-based self-management intervention for bipolar disorder “Living with Bipolar”: a feasibility randomized controlled trial. J Affect Disord. 2014;169:21–29. Whybrow PC, Grof P, Gyulai L, Rasgon N, Glenn T, Bauer M. The electronic assessment of the longitudinal course of bipolar disorder: the ChronoRecord software. Pharmacopsychiatry. 2003;36(Suppl 3):S244–S249. Depp CA, Kim DH, de Dios LV, Wang V, Ceglowski J. A pilot study of mood ratings captured by mobile phone versus paper-and-pencil mood charts in bipolar disorder. J Dual Diagn. 2012;8(4):326–332. Moore PJ, Little MA, McSharry PE, Goodwin GM, Geddes JR. Correlates of depression in bipolar disorder. Proc Biol Sci. 2013;281(1776):20132320. Schachner DA, Shaver PR, Gillath O. Attachment style and long-term singlehood. Pers Relat. 2008;15(4):479–491. Simon RW. Revisiting the relationships among gender, marital status, and mental health. AJS. 2002;107(4):1065–1096. Depp CA, Mausbach B, Granholm E, et al. Mobile interventions for severe mental illness: design and preliminary data from three approaches. J Nerv Ment Dis. 2010;198(10):715–721. Holmes EA, Deeprose C, Fairburn CG, et al. Mood stability versus mood instability in bipolar disorder: a possible role for emotional mental imagery. Behav Res Ther. 2011;49(10):707–713.